Although we had zipped up the door in order to stay warm, the next morning when we awoke there was no condensation on the nylon walls of our roof-top tent. 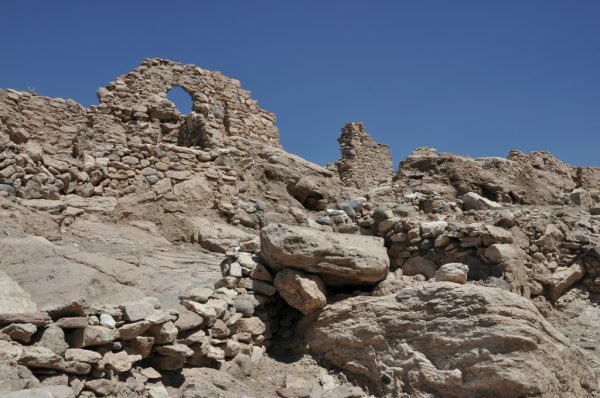 So arid is the air flowing over the Atacama Desert that the damp breath from four bodies was easily absorbed. We wriggled into our clothes, squirmed our way out of the door, and dropped down the ladder, one by one. By the time the coffee was made, the sun had arisen too and the valley was growing light. We ate a quick breakfast and then we made our way back to the busy main road. At the side of the road, where we rejoined it, there was a shrine. 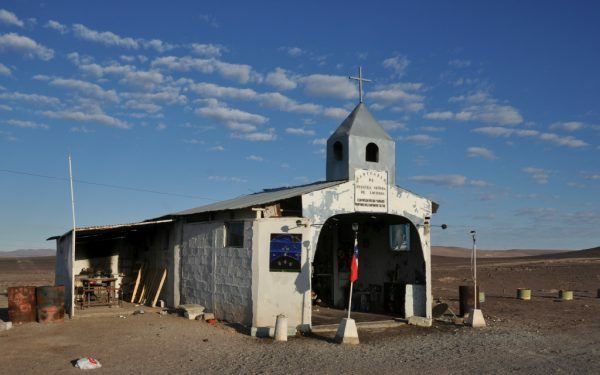 Route 5 is lined with such shrines, as too are Chile’s lesser roads, it being the custom here to erect a monument whenever someone dies in an accident. I seem to sense a pagan instinct behind the tradition (albeit no more pagan than the idea of wafting incense aloft to attract the attention of a saint), but whatever else they do, these roadside memorials certainly provide a constant reminder of our mortality and of the danger inherent in hurtling along at 120km per hour in a tin can. 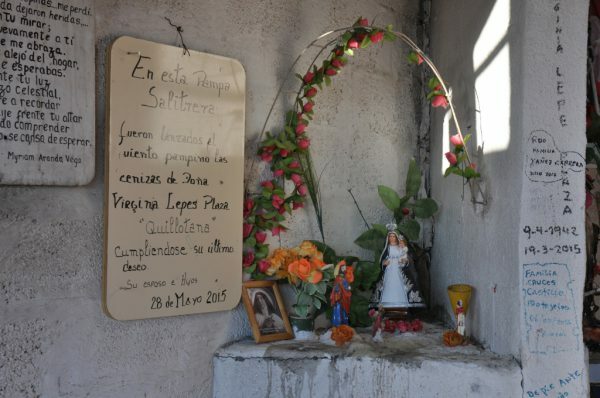 Most of the shrines are the size of a dolls’ house, but this particular one, next to the track leading to Mina Alemania, is a crudely built chapel. Adjacent to the chapel is a lean-to with a bench and a fireplace, and in the chapel itself there are various memorials. At first we thought that it must have been the site of a big pile-up, but reading the inscriptions we decided that it is simply a place where certain people feel a connection with the land or feel inspired to recall their loved ones. I’m told that most of the shrines along the wayside in Chile are dedicated to lorry drivers who fell asleep at the wheel – and we’d noticed that there are often hard-hats and worker’s boots placed in front of the shrines – but one of the monuments within the Alemania chapel was evidently constructed in honour of a young child. Piles of cuddly toys had been placed there. The toys were now grimey with sand and dirt, and they gave the place an especially depressing aura. On we went, across the utterly barren brown wasteland. Was it ever fertile, I wondered? Is the Atacama Desert really an entirely natural phenomenon, or did ancient man do something foolish, such as allowing his llamas to overgraze the entire area? 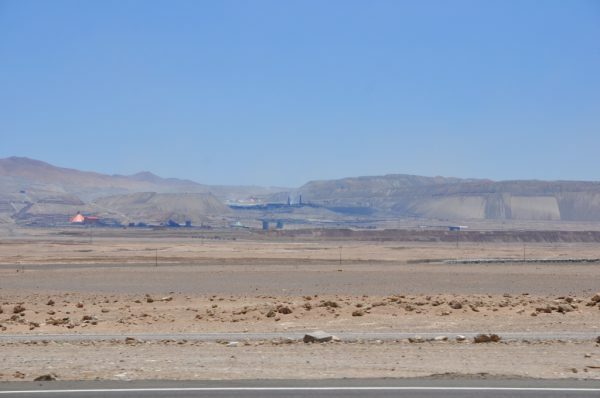 Ruta 5 took us through the industrial chaos which rims the inner edge of Antofagasta; but having once again topped up the fuel tanks we then swung inland, along the highway which leads towards the mountains. Now, certainly, we were entering an area which is not entirely natural, for we were embarking across the Nitrate Plains. These empty acres are what the Pacific War was all about. No, we hadn’t heard of it either, but that’s because it didn’t involve Europe or the USA. The Pacific War was fought between Chile, on the one hand, and Peru and Bolivia on the other. Before the war, the northern third of Chile belonged to these other two countries. 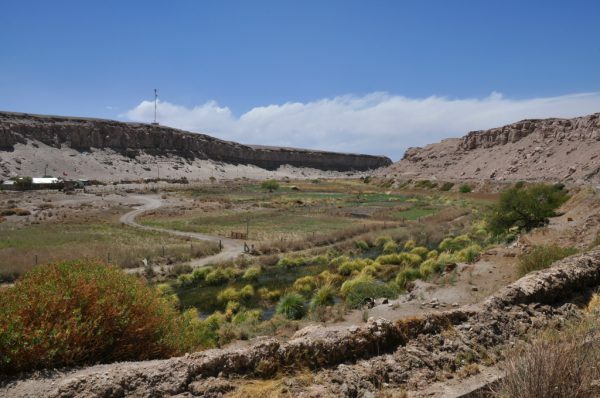 Some 30 years after the trio gained independence from Spain (in the 1830s), the region inland from Antofagasta was found to be a fabulous source of fertiliser. Accordingly, some 80 oficinas, or factories, took root on the dry brown plain. Men and machines got to work, removing the top four or five metres of soil and boiling it up in vats. The residual solution was then spread out in the sunshine, like brine at a salterns, and after it had crystallised the pure ore was sent to the coast. Here, a disparate fleet of merchantmen waited to carry the prize to Europe – for already our industrial farming methods had depleted the native soil, making fertilisation essential. Although the oficinas were on Peruvian and Bolivian soil, they belonged to British and Chilean companies, and over half of the workers were Chilean. Indeed, in the region of Antofagasta as much as 80% of the workforce was from Chile. Thus it was that, when, in 1878, the Bolivian government decided to raise export duties, their Chilean counterpart had no hesitation in reacting with force: They promptly sent in the troops. Fearful for its own nitrate pampas, adjacent, Peru quickly allied herself with Bolivia. 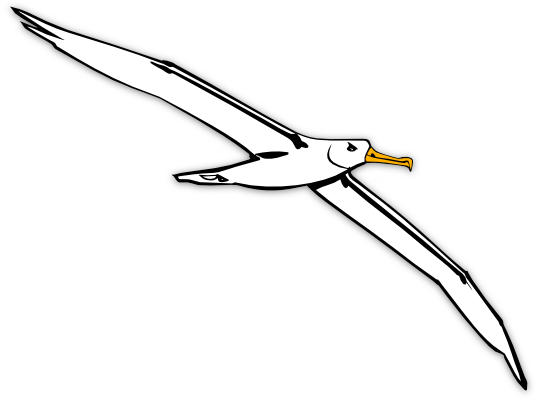 Since the Chileans already had de facto control of the contested territory, the battle moved out to sea – and since Bolivia didn’t have a navy, this put them out of the picture. The defeat of the Peruvian navy took only a few months to achieve, but the war dragged on for another four years while the Chileans sought to punish and humiliate their enemy; and eventually they succeeded in invading Lima. To this day, the supposed hero of the Pacific War is still celebrated with busts in every Chilean town square. (I say supposed, because I’ve been told that Arturo Prat was well-named and that he was actually just the fall-guy sent to die in the right place at the right time.) To this day, too, official relations between Chile and her neighbours are strained, and Bolivian petrol-pump attendants won’t fill cars with Chilean plates – or so we were told. Unfortunately we didn’t have the chance to explore this situation since Chilean rental cars are not allowed to enter either of those ‘dangerous’ bordering states. Our sights were now set on the vast salt pan which lies on eastern side of the desert, at the foot of the Andes. 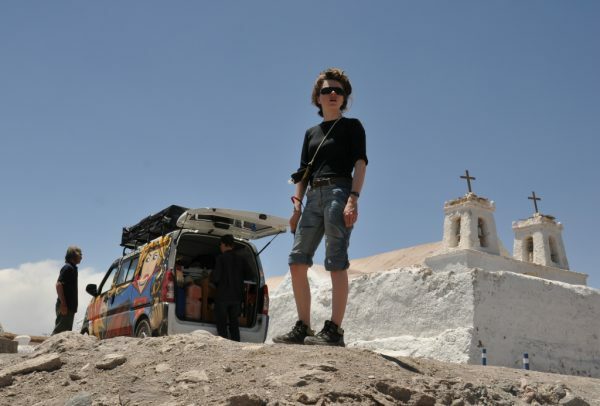 Specifically, we were heading for the village of San Pedro de Atacama. But rather than approach San Pedro in the usual way, along the main road, we had decided to come at it via the mountains and valleys to the north. Nestled amongst these mountains is a ‘geyser field’. This is a place where a finger from the Earth’s molten core reaches close to the surface and heats the water in an aquifer. The geysers at El Tatio were said to be nothing much in comparison to the ones in Iceland. Those Icelandic geysers shoot plumes of water into the sky, whereas the Chilean ones only release steam. Even so, with the sun shining through them at daybreak, El Tatio’s steam engines are reckoned to be worth seeing, and so the place features on the itinerary of the tour companies in San Pedro. 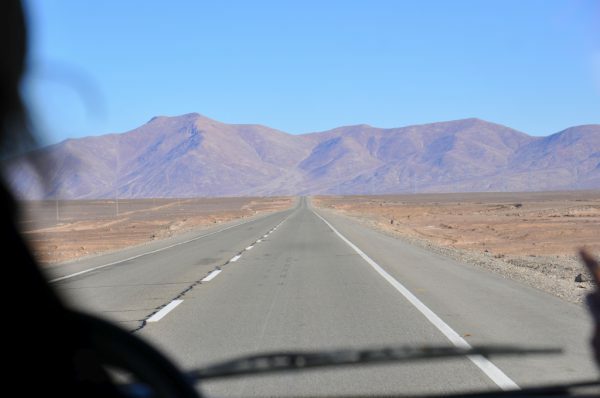 We stopped for fuel and water in a grubby town called Calama. This place serves the nearby copper mine of Chuquicamata, which is said to be one of the two biggest open-cast pits in the world. 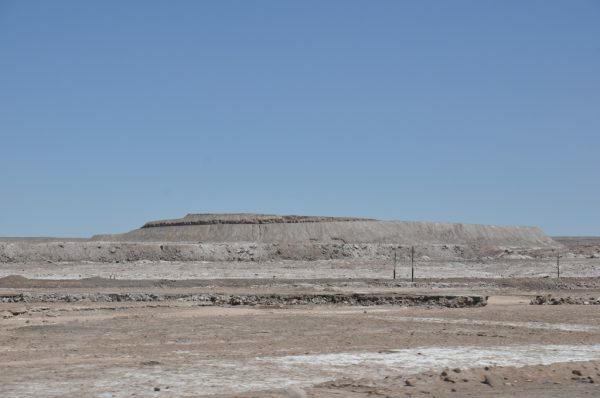 (The other is called Escondido, and it lies a short way south of the Atacama salt pan.) 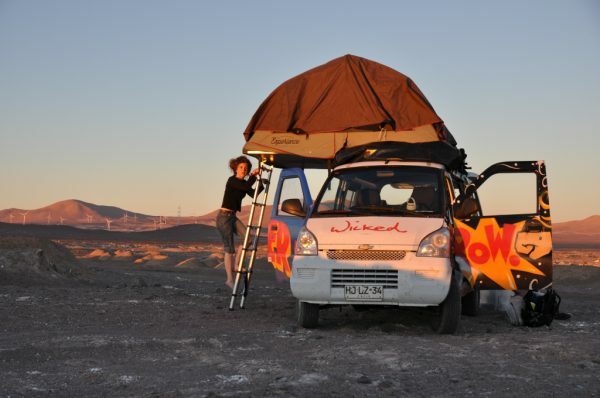 We filled everything to the brim, and then, on the far side of Calama we left the busy highway, ducked down a track – and within half an hour we were driving into the little village of Chiu-Chiu. You remember that bit at the start of ‘The Good, the Bad and the Ugly’, where Clint Eastwood walks into a windswept village in the middle of nowhere? Well, that could be Chiu-Chiu. Same wind; same dust; same adobe houses. 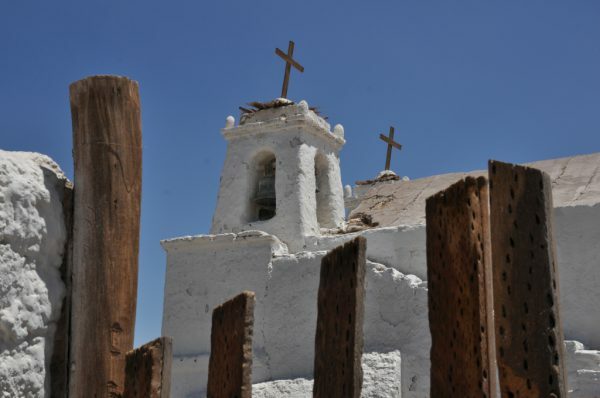 But Chiu Chiu also has an ancient adobe church. And Chiu-Chiu is sited alongside a stream. A STREAM! Goodness, it looked strange in the middle of the desert! There were green reeds growing alongside the stream, and the people had created allotment gardens and irrigated them. Mind you, we were told that the villagers don’t grow as much food here as they used to – and that’s because they’re not so shy as the ones in that old film. Rather than run to hide in their houses, the people of Chiu-Chiu greet the tourist with offerings of sopapillas (pan-fried bread), mote con huesillo (barley with peaches), and toy llamas stamped with ‘A Present from Chiu Chiu’. Thus they are able to earn the money to buy what they might otherwise grow. The church is crafted entirely from local materials. 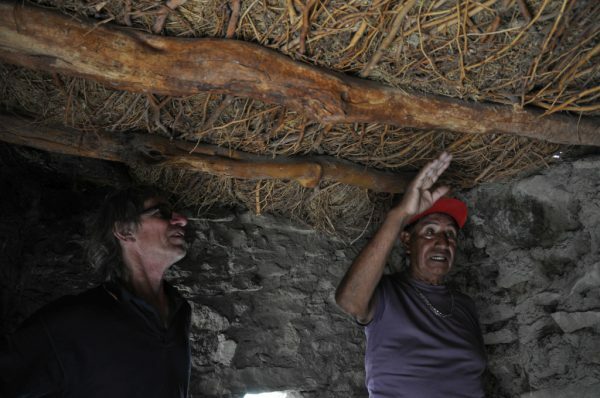 The walls are made from adobe (mud mixed with plant fibres) and the roof is made from cactus planks which are subsequently plastered with mud. The gate in the foreground is also made from cactus, and the planks are fastened together using llama-leather thongs. From Chiu-Chiu we detoured up a track which led alongside the stream in a narrow gorge. Here, every available inch of the flood-plain was being used to grow vegetables and maize – and it has been farmed in this way for a very long time. On the steep sides of the gully there are petroglyphs which were created by the Amerindian ancestors of the present inhabitants. We failed to spot any of this artwork (perhaps because we had no idea what it was supposed to look like), but at the head of the valley, where the road clambered back up the valleyside, we reached the settlement of Lasana and discovered some far more substantial remnants of the antique culture. Alongside the tin-roofed, concrete-block houses of the present day village is a warren of tiny stone homes which cling to one another for support and protection as they scramble along the cliff-edge immediately overlooking the valley. 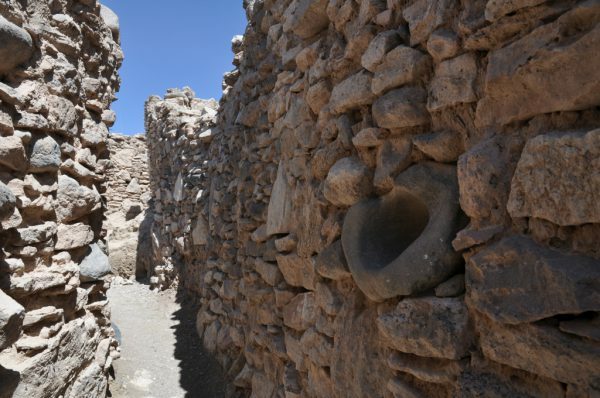 Roofless and semi-ruinous, these tiny dwellings were home to a people known as the Atacameno, who lived and farmed here before even the Incas arrived. Looking down from Puakara Lasana. The citadel stands on a ridge between the river-gorge and the modern village. The quern pictured in this photo had a hole worn in the base. It fascinates me to think of how many years it must have been in use (perhaps for hundreds? ), but I am also intrigued by the mind of the person who built it into the wall. It serves as a primitive spy-hole. Irrigation and maize were two other things that the newcomers brought with them – (“Before that, we used to eat the seeds from the algarrobo tree”) – and along with these they introduced taxation. 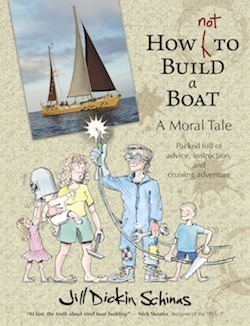 The usual story, indeed – so, perhaps the Incas only got what they deserved when the Spanish conquistadors turned up, in due course, and wreaked their own brand of havoc. Eventually, I’m sure, we all only reap what we sow. Our guide was still pouring forth information: “This is where the cacique mummy was found, but the archaeologists stole him… This is one of the granaries…”. It was all interesting stuff, and the idea that this man’s ancestors may have been growing food in this oasis for millenia was fascinating – but the day was rolling past and we still had to scale the summit to the pass. We slipped some notes into the old fellow’s hand and gently pulled ourselves away. We rejoined the road and set off up the valley. Join us again soon for the next thrilling instalment!